Composed of visible and infrared observations from Hubble’s Wide Field and Planetary Camera 2, this Hubble image shows a pair of interacting galaxies known as IC 2184. This large “flying V” is actually two distinct objects — a pair of interacting galaxies known as IC 2184. Both the galaxies are seen almost edge-on in the large, faint northern constellation of Camelopardalis (The Giraffe), and can be seen as bright streaks of light surrounded by the ghostly shapes of their tidal tails. These tidal tails are thin, elongated streams of gas, dust and stars that extend away from a galaxy into space. 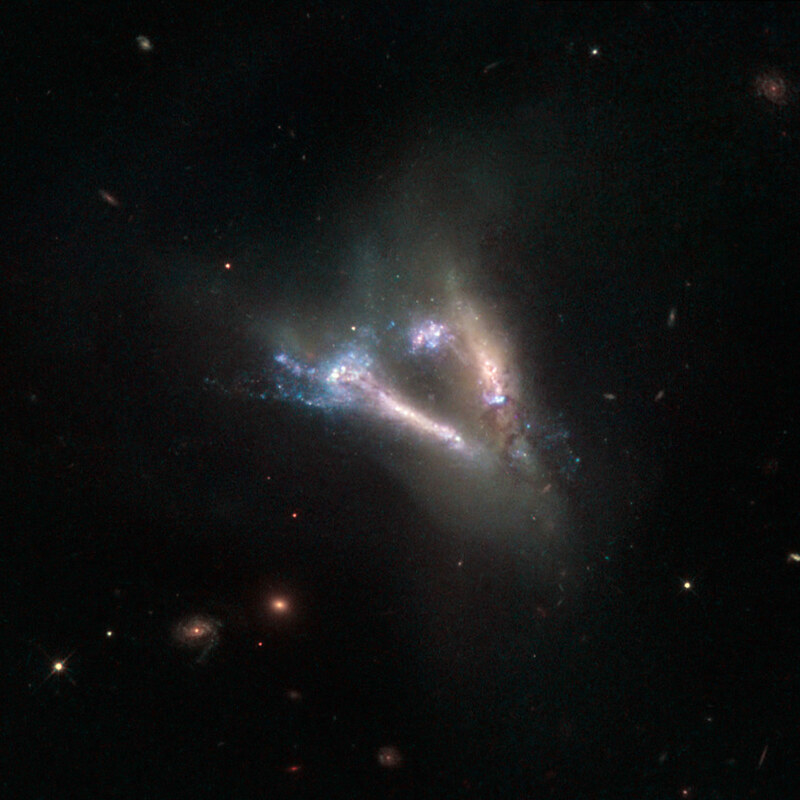 They occur when galaxies gravitationally interact with one another, and material is sheared from the outer edges of each body and flung out into space in opposite directions, forming two tails. They almost always appear curved, so when they are seen to be relatively straight, as in this image, it is clear that we are viewing the galaxies side-on. Also visible in this image are bursts of bright blue, pinpointing hot regions where the colliding gas clouds stir up vigorous star formation. The image consists of visible and infrared observations from Hubble’s Wide Field and Planetary Camera 2. 1 Comment on "Hubble Views a Pair of Interacting Galaxies Known as IC 2184"
The length of time it takes for galaxies to merge is breathtaking. How does one conceive of 700 million + years?